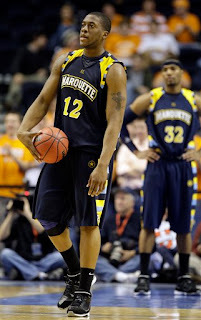 Marquette Falls to Tennessee ~ The Bucky Channel - The World of Sports from Wisconsin's Perspective. It was close for most of the game, but Marquette never could quite get over the hump. The game was tied at 32 heading into halftime, and Marquette did all they could to stay in this one. However, it just wasn't enough. The end result: an 80-69 win for Bruce Pearl and the Tennessee Volunteers. Because I didn't get to see the game, and because I'm writing this almost 24 hours after the fact, I'm going to take the easy way out and give you some links. And here's Sportsbubbler.com's (and MU alum) Dan Walsh's take.